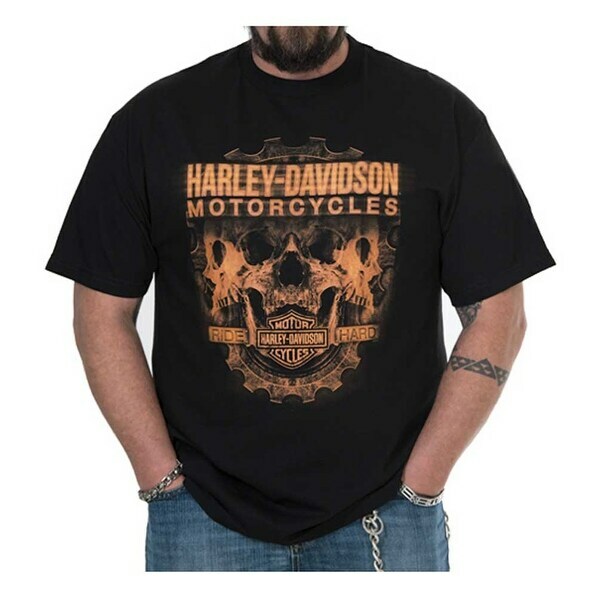 Harley-Davidson® Men's Profile Skulls Short Sleeve T-Shirt - Black, 30298454. Decked out in a custom flaming skull graphic with bold Harley-Davidson® script and a famous Bar & Shield logo screen printed on front. Back features our Wisconsin Harley-Davidson Dealer logo. Classic crew-neck style, traditional comfort fit. Extremely soft, high-quality tee, made from 100% cotton. Guys you can never have too many black tees! For a longer fit, check out the tall sizes. 30298454.